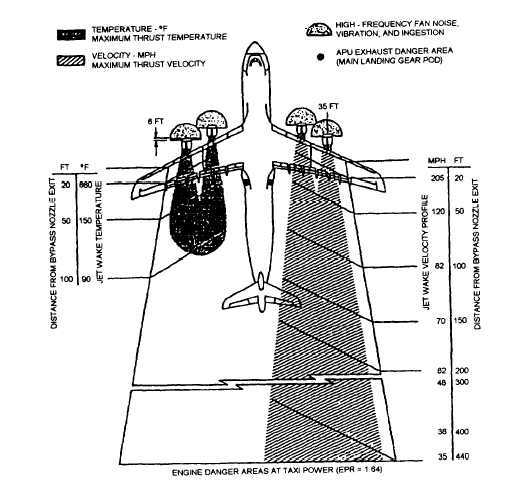 Figure 4-20.Required ear protection in vicinity of aircraft. 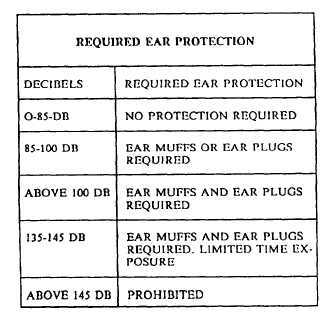 Home > Construction Training Manuals > Naval Construction Force/Seabee 1&C > Figure 4-20.Required Ear Protection In Vicinity Of Aircraft. Figure 4-19. - Engine danger areas - at taxi power. Do not permit personnel to walk in front of vehicles that are being driven near or are being backed into an aircraft. Figure 4-20. - Required ear protection in vicinity of aircraft. Observe the circle of safety rules, as indicated in figure 4-21. Do not permit vehicles to park within 25 feet of an aircraft. Park vehicles parallel to the wing axis with the ignition off, transmission in its lowest gear, parking brake set, and wheels chocked (fig. 4-22). Chocks are not required if the driver remains in the vehicle. Between sundown and sunup, lights should be left in the park position. Ensure all personnel wait in the marshalling area, unless they are specifically assigned to a job in the aircraft loading zone. Do not permit personnel to enter an aircraft cockpit or other restricted areas, unless they are requested to do so by the aircrew. Observe all flight-line speed limits. They are aircraft parking ramp = 10 mph, within 25 feet of the aircraft = 5 mph, inside the aircraft= 3 mph. These limits must be followed at all air terminals unless otherwise directed by terminal or flight-line officials.